The RunGood Old West Poker Series at the Hard Rock-Tulsa was a record success. The RunGood Old West Poker Series at the Hard Rock-Tulsa was a record success. Three of the five events broke attendance records for the venue, including the $675 Main Event. Over $350,000 in cash and prizes was awarded during the six-day series. The weekend wrapped up with Jerry Moore of Omaha, Nebraska taking down the Main Event and $38,417. Three of the five events broke attendance records for the venue, including the $675 Main Event. When three-handed play began in the Main Event, Jerry Moore held 3,420,000 chips, Kiran Suram held 2,760,000 chips, and Louie Huynh held 1,520,000. 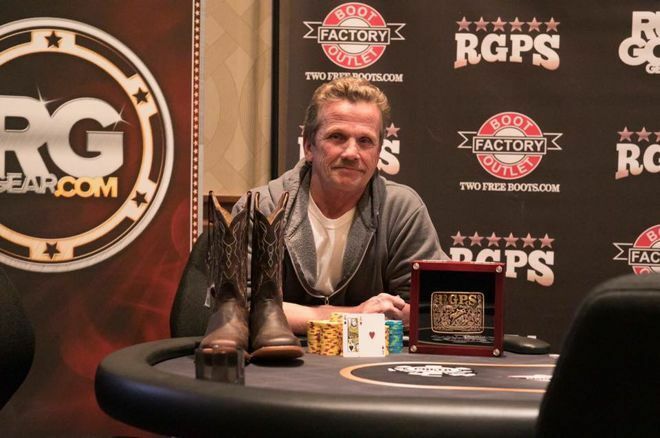 The three players began discussing a chop as they played a few hands, and ultimately reached an agreement that awarded Moore $38,417 and the title of RGPS Main Event Champion. Moore is a former flooring and remodeling contractor who used his experience and expertise to go into the house-flipping business. Moore left that behind just shy of a decade ago to pursue a career as a professional poker player, and he hasn't looked back. Asked what he'll do with his winnings, his first answer was, "Nothing," but later clarified that it would be added to his poker bankroll to play more events, including the final RGPS fall stop in December. The chop agreement saw second-place and $36,917 go to Kiran Suram, while Louie Huynh received $32,417. As for the non-monetary prizes, Moore collected the Montana Silversmiths championship belt buckle for himself but elected to gift the cowboy boots from Boot Factory Outlet to Suram. This tournament marked the conclusion of the RGPS in Tulsa. RunGood thanked the players and staff at the Hard Rock for making the RGPS Old West such an exciting and fun-filled week! The RGPS broke attendance records in multiple events and paid out record prizes as a result. The next and final stop on the RGPS Old West tour is Downstream Casino Resort in Joplin, Missouri, running December 4th-9th. Chumba Casino Wants You to "Shake It, Baby Shake It"